Ready to take your green life further, but not sure how? Living a plastic-free life is a great way to reach the next green standard of earth-friendly living. But before I tell you how we’ve taken steps to becoming plastic free, let me tell you a bit about my wife. I love my wife to death. One thing I love most about her is how caring she is to me, our children, and equally importantly, the Earth. She transformed my thinking about how we can care for our environment, and she is a constant inspiration to me in this regard. I give her full credit for taking the initiative to rid our lives of plastic, and the best I can do is share our story and message with the world here. Like many of her green ideas, I gave her the, “that’s not possible” look when she first explained it to me, but again, she has proven to me that, like Justin Bieber becoming a pop sensation, anything is possible. Why go plastic free? Well, you’ll avoid possibly harmful plastics that contain BPA or other toxins, and you’ll be disposing of less plastic, which does the environment a huge favour. 1. Replace all “tupperware” containers with glass containers. My wife went on a mission to find glass containers of all sizes, and she did. We donated all our old “tupperware” and put our bright and shiny new glass containers on the shelf in their place. 3. Avoid plastic packaging and bagging fruits and veggies. Some people give me a crazy look, but, if I buy five apples, I just throw them in my shopping cart without putting them in a plastic bag. There’s no need to put them in a plastic bag. When I put them on the conveyor belt at the cash, I just put them in a neat pile together, the cashier weighs them, I put them in my cloth shopping bag, and I’m done. Also, if I’m buying say, tomatoes, and I have the option of buying tomatoes that are pre-packaged in a plastic container or tomatoes that are just hanging out in the open, I’ll choose the latter, and I won’t put them in a plastic bag. 4. (I’m going to sound like a broken record with this one) Use cloth diapers. This is a biggie, and I’ve said this many times before… its simply a great way to reduce waste and plastic usage. 5. Get a stainless steel water bottle. 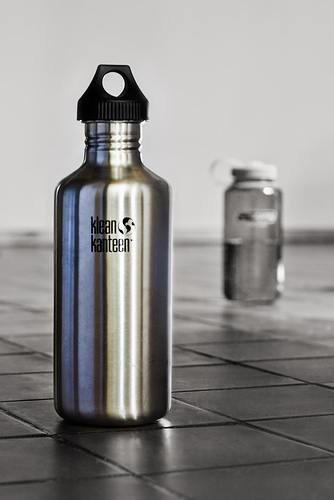 We use Klean Kanteen water bottles, and they are, simply put, awesome. They are made of stainless steel, are BPA free, and do not have any synthetic lining that some other steel water bottles have. It keeps the water tasting fresh and clean. The benefits of using a stainless steel water bottle are twofold: a) you avoid using a plastic water bottle, which may have BPA, or just makes the water taste like plastic after awhile, and b) you avoid buying bottled water, which is a huge waste of plastic. 6. Throw out the vinyl shower curtain. We had the luxury of renovating our bathrooms recently, and when we did, we gladly threw out our shower curtains and replaced them with glass shower and bath walls. Okay, this option is a bit more expensive, but it is worth it in the long run, as some vinyl shower curtains (especially those containing polyvinyl chloride) have been shown to release toxic chemicals into the air. 7. Get stainless steel lunch boxes for the kids. There are cool stainless steel lunch boxes available these days that have that retro look and feel to them that makes them even more cool. We did away with the kids’ plastic lunch boxes and replaced them with stainless steel ones. 8. Breastfeed. If your wife (or you, if you’re a mom reading this) can breastfeed, by all means, do it. Not only are there a zillion other benefits to breastfeeding, but you also don’t need to use any plastic bottles to do it. I realize there are reasons why some moms can’t breastfeed, but if you can, then this is a great way to go plastic free. Are you going plastic free, or are you inspired to try now? Leave a comment and let me know what you think! This is inspiring… we are guilty of the tupperware, shower curtain and diapers. We don’t live in the US and cloth diapers are hard to come by here, but I am pushing for them. Thanks for this post. Good luck with that Get Ready Dad! Glad to hear you are pushing for the cloth diapers, and that this inspired you. All the best to you! Wow – I have never even thought about the shower curtain as a toxin source. Thanks for that info. Congratulations on going plastic free! Hi Megan, thanks! And glad I could share something new with you, its amazing how surrounded we are by plastic! This is a perfect guide. I realized that I should start doing this too. I need to live a plastic free too. Thank you for sharing this one. Thanks Work at Home Dad. I wish you all the best in your journey toward plastic free living! if renoing your bathroom isn’t an option, you can also try replacing your vinyl shower curtain with a hemp one. they aparently work quite well, though sadly I haven’t been able to track down one locally as yet. Thanks Staceass, a hemp shower curtain is a good idea! I haven’t seen them, but it would be worth looking for. Thanks for the tip! I stopped buying soda thus eliminating thousands of cans and cardboard–and also switched to glass bottles for milk, eliminating plastic jugs. I always carry cloth bags with me for shopping. I admit I still have some platic containers at the house, but also use corning ware more–I have also begun to use wax paper again instead of sandwich bags. That’s great LKS — good to hear, and thanks for sharing! These are some inspirational ideas!